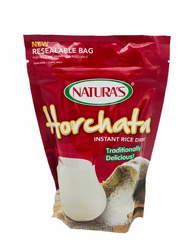 Natura's Horchata Instant Rice Drink 14 oz. Horchata is a refreshing cold drink made of rice or rice flour, water, almonds, cinnamon, and sugar. The Horchata drink is said to be veryhelpful for stomach aches, hangovers and when you are sick. In Spain they drink Horchata de Chufa (Tiger Nut) which has a different flavor than the Mexican Horchata. Chufa nuts have their origin in ancient Egypt. Mezcla para preparar bebida de horchata hecha con arroz, canela y az�car. Natura's. Licuados. Best Horchata on the Market! 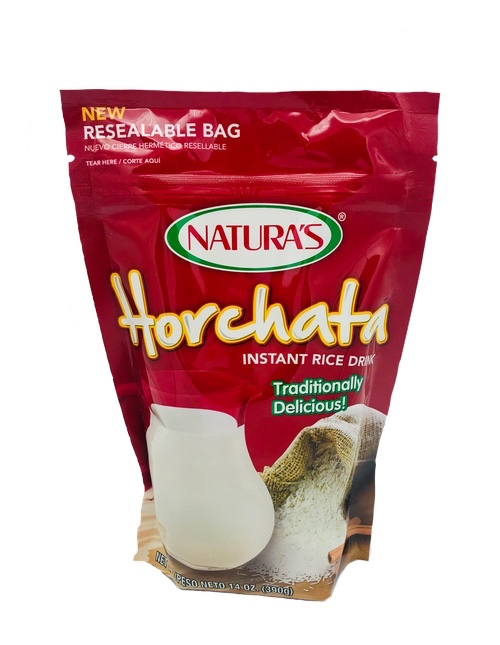 My family loves this brand of Horchata!We have tried almost all types of Horchata and this particular brand is the Top of the Line!The sweet taste along with adding a bit of cinnamon truly makes a great refreshing beverage.We love it!!! Delicious and refreshing drink especially now in summer and anytime. I truly enjoy this product. Easy to mix up with milk or water. I'll be reordering soon. ConsThe zip lock bag it comes in does not stay closed well. Cons Needs equal parts whiskey for a hangover and for a cold Philly Winter Day . I love this drink mix, but it is very hard to find. I've only ever had the chance to enjoy 1 bag of this stuff, and I've never forgotten it. I'm so glad I thought to search it online! Seriously this stuff is delicious, there is no nasty aftertaste like I get with Klass brand horchata mix. I have to drink that stuff very weak. I'm glad to have found this again. BUY IT!